Thanksgiving has a few time honored traditions for those of us who cook a turkey: first, you eat your turkey. Next, you have seconds. Later, you wrap up all the turkey leftovers. Then, for the remainder of the week, or for as long as you can mentally gear up, you make turkey sandwiches for lunch, and turkey soup and casserole for dinner. It doesn’t take long before you’re wailing: That’s it. I’ve had it with turkey leftovers. And then, miraculously, Thanksgiving slips from memory as you head into the rest of the holiday season. A blissful eleven months pass, thoughts of turkey forgotten, until Thanksgiving rears its once-a-year head again. I’ve been in this boat. 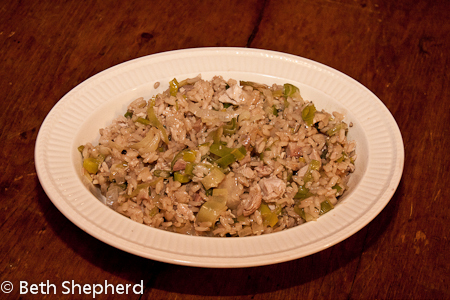 But this year I discovered a recipe for Turkey Leek Risotto. I made it. Big Papa and I ate it. And I’ll be danged if there wasn’t a tear in my eye when we polished off the leftovers from the Turkey Leek Risotto made with our Thanksgiving turkey leftovers. Rue the day you tossed the last of the leftover turkey and said: That’s it. I’ve had it with turkey leftovers! 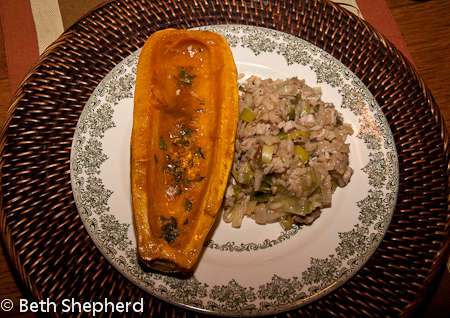 Note: I served my risotto with Delicata squash (which I baked in the oven with a bit of butter, brown sugar and fresh sage. Bring Turkey Stock to a simmer in a medium saucepan (do not boil). Keep warm over low heat. Melt 1 teaspoon butter and 1 teaspoon oil in a large saucepan over medium heat. Add leek to pan; cook 7 minutes or until tender, stirring occasionally. Stir in 1/4 teaspoon salt. Place leek mixture in a small bowl. Melt remaining 2 teaspoons butter and remaining 1 teaspoon oil in pan. Add shallots to pan; cook 2 minutes or until tender, stirring occasionally. Add rice; cook 2 minutes, stirring constantly. Stir in wine; cook 1 minute or until liquid is nearly absorbed, stirring constantly. Stir in 1/2 cup stock and 1/4 teaspoon salt; cook until liquid is nearly absorbed, stirring constantly. Add remaining stock, 1/2 cup at a time, stirring constantly until each portion of the stock is absorbed before adding the next (about 28 minutes total). Stir in turkey and leek mixture; cook 1 minute or until thoroughly heated. Remove from heat; stir in remaining 1/4 teaspoon salt, pecorino Romano cheese, thyme, sage, and pepper. Want more deliciousness that’s not leftover? Check out Wanderfood Wednesday!